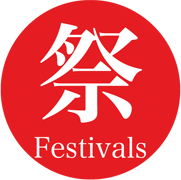 The festival has a long history, having first began in 1750. 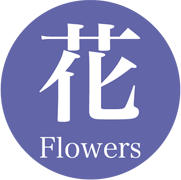 It is said to be named after the uchiwa, a Japanese hand fan, which festival merchants gave to customers in the past. 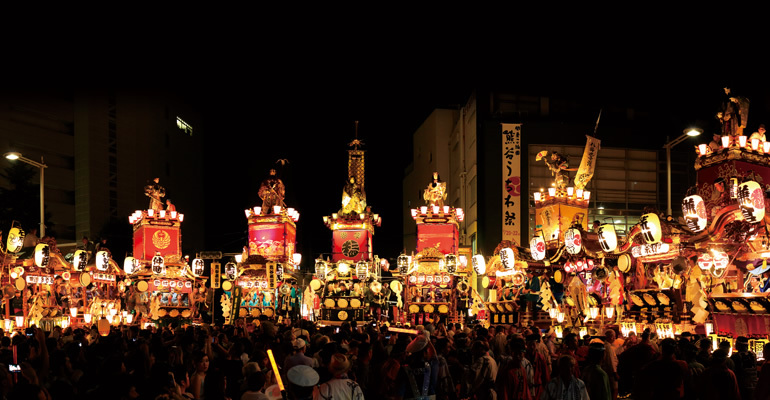 On the first day of the festival, the deity of the shrine is transported ceremoniously to the main venue from Kumagaya's branch shrine of the Kyoto Yasaka Shrine. 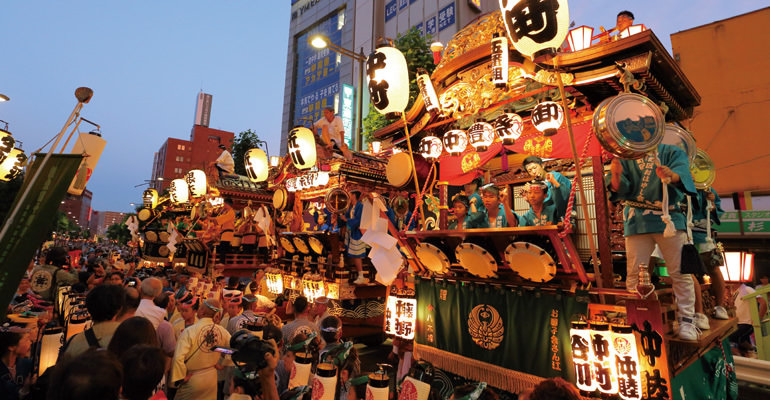 The floats, called dashi or yatai, carry a band that perform music offered to the deity. This offering is a prayer for prosperity and good harvests. 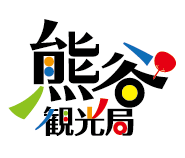 It is a big event representing the city of Kumagaya Fireworks are fired off on the river bank of the Arakawa River which is only a 5 minute walk from Kumagaya Station. 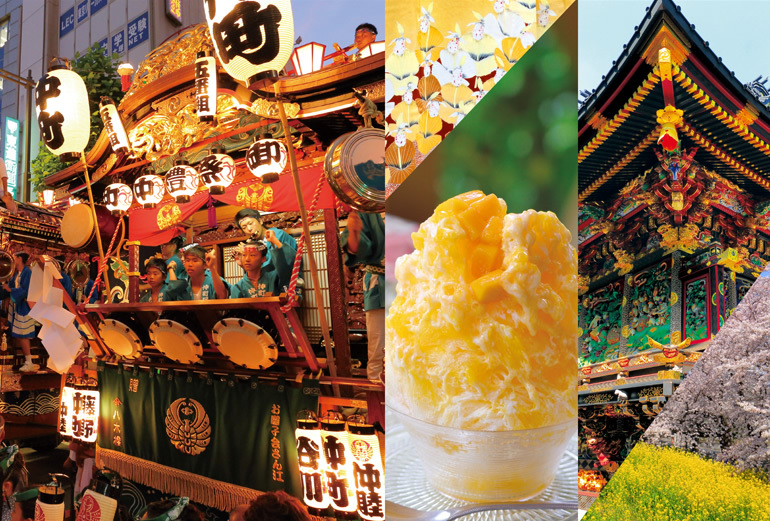 You can fully enjoy the summer nights of Kumagaya which are known for their high temperature. Many fireworks are shot off by supporting citizens, stores and companies in Kumagaya while their names and PR messages are announced. 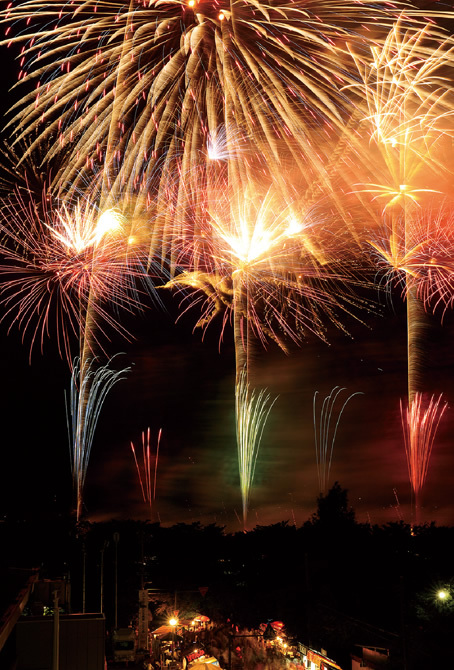 Please enjoy Japan in a variety of ways such as viewing the huge fireworks's which are displayed in the night sky while wearing traditional Japanese summer wear (Yukata) or eating finger foods of Japanese cuisine. 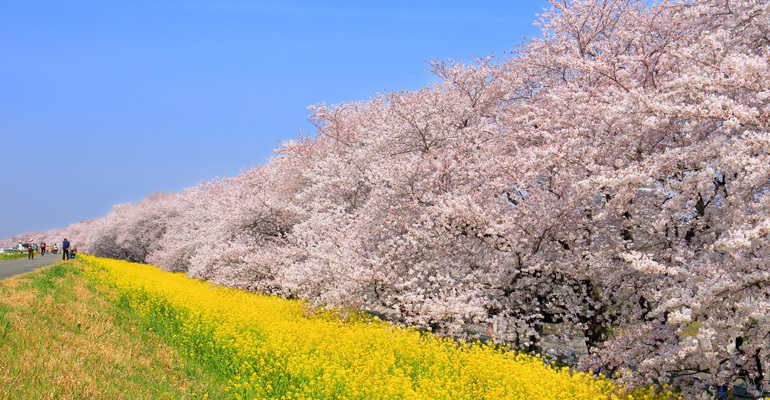 About 500 cherry blossom trees line 2 kilometers of the Arakawa River bank, just five minutes' walk away from Kumagaya Station. You can enjoy the view from the top of the bank or pass through the “corridor” formed by the cherry blossom trees at the bottom. 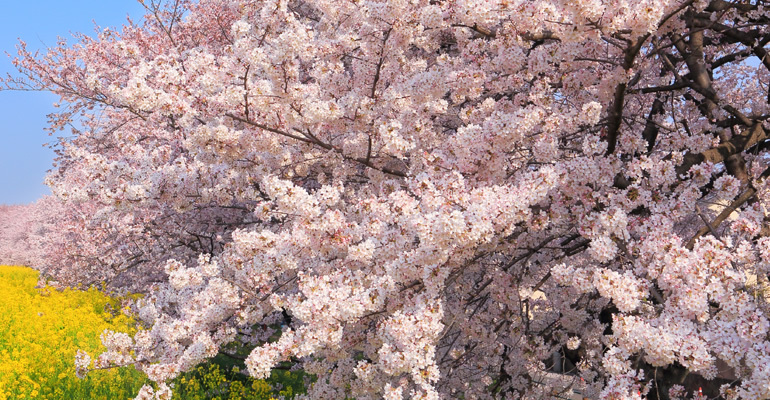 The cherry blossoms are an essential part of Japan's spring, so please come and enjoy them! Kumagaya's Nogoji Temple is also known as the Hydrangea Temple. 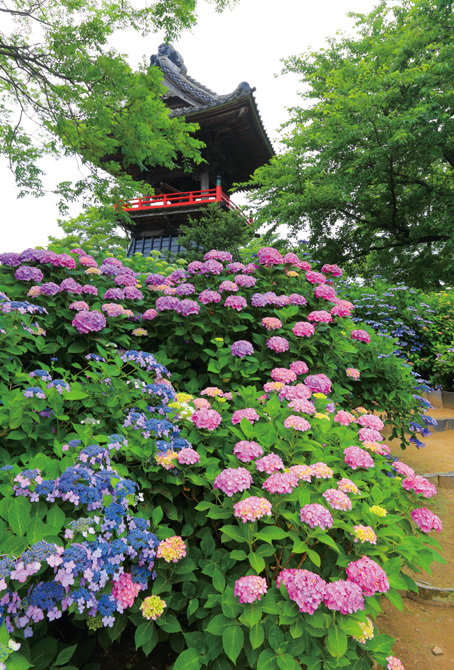 In June, the temple is filled with blooming hydrangea flowers of every color. There is a beautiful contrast between the vivid hydrangea flowers and the temple's bell tower, making this a great location for photos. Come and enjoy the tsuyu, or rainy season, that lies between spring and summer! 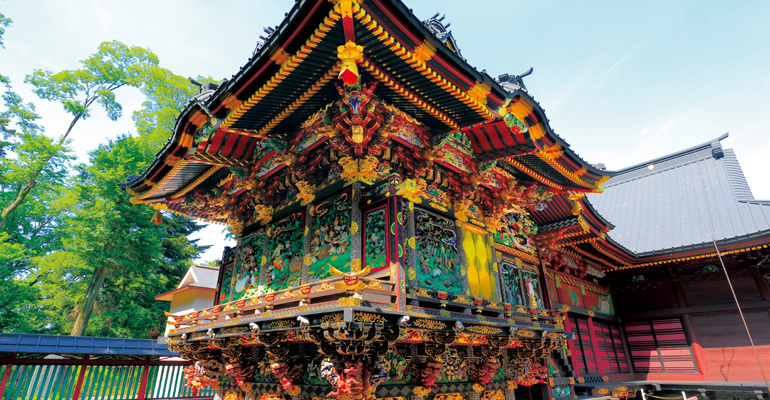 It has long been said that Shodenzan is a place that answers prayers for marriage. It is a relaxing place enjoyed by many people, fostering romantic relationships, friendships and business relationships. 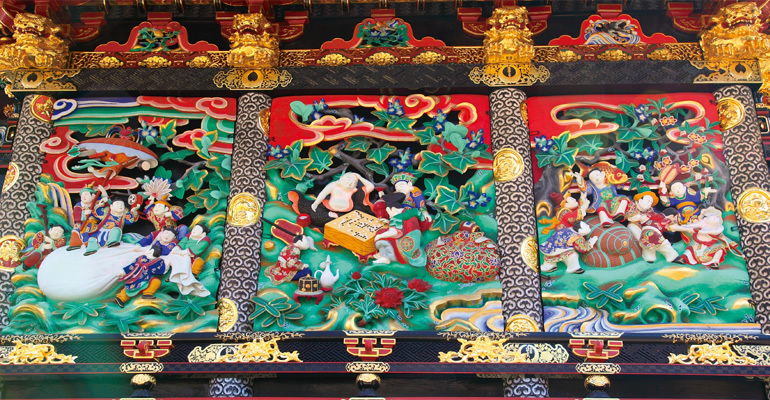 The most spectacular sight is the gorgeous sculptures and carvings in the Shodendo building. Quaint shops and Japanese-style confectionary stores built in historical Japanese houses surround the Shodendo building,. Feel free to explore the shops and greet the friendly owners! Kumagaya is one of the leading producers of wheat in Japan. 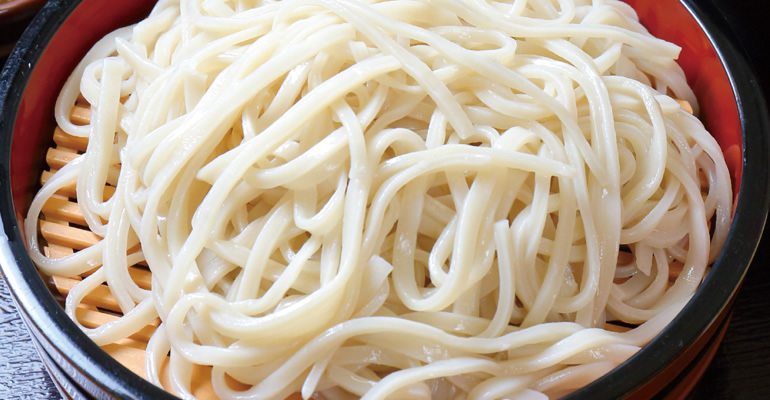 Kumagaya udon noodles have a texture and fragrance that you can't find in pasta. Udon dishes are a traditional Japanese favorite, so give them a try! 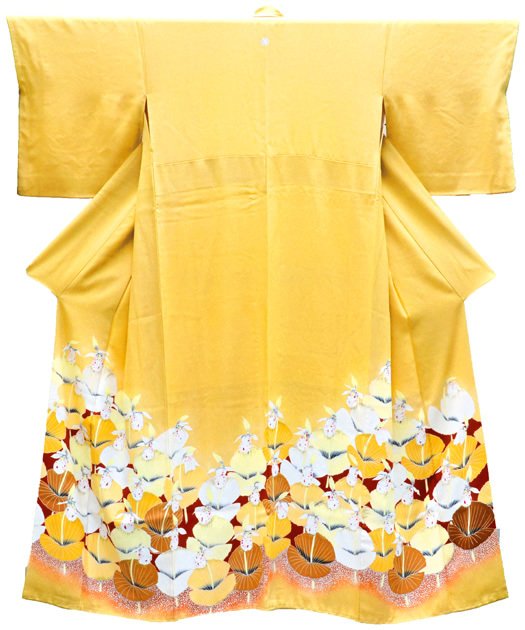 Gokabo is a traditional Kumagaya confectionary item. 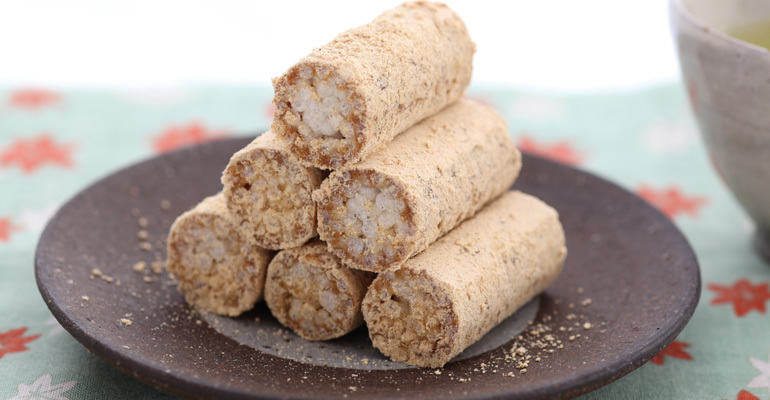 Its ingredients such as the glutinous rice, soybeans and starch syrup are all natural, making gokabo a healthy snack. Kinako, or roasted soybean flour, is rich in vegetable fats such as isoflavone, linoleic acid, alpha-linolenic acid, oleic acid and lecithin. Try some gokabo and enjoy its slightly sweet, exquisite aroma and sticky texture. 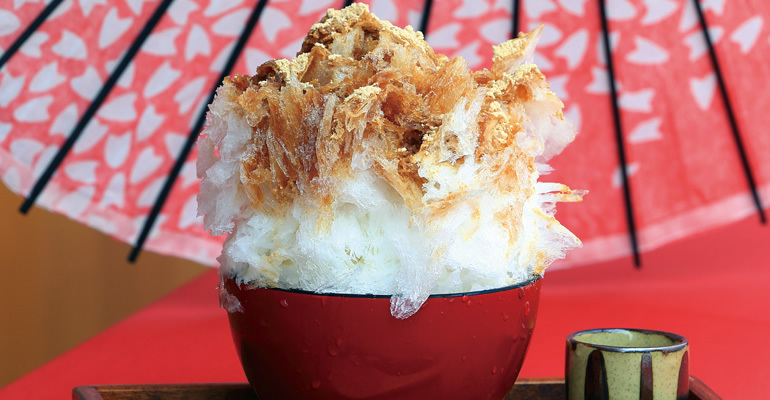 Yukikuma, a type of shaved ice, is a staple cold dessert for summer in Japan. Snow-like shaved ice made from Kumagaya's water, and each store pours their own original syrups over it. 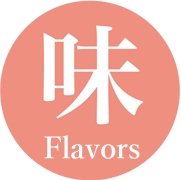 Each store has their own unique, original flavors, so make sure to try a variety! Kumagaya gets very hot in summer, making Yukikuma taste even better. 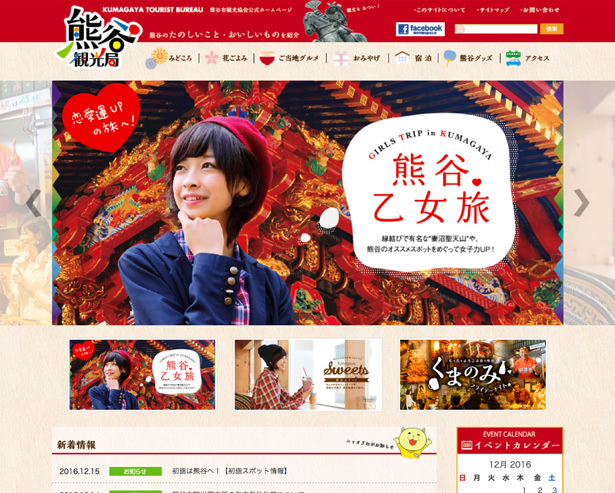 There are also stores that offer Yukikuma during the winter, so check them out as well! 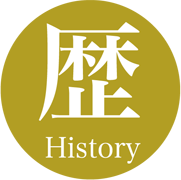 The textile dyeing industry has always flourished in Kumagaya. 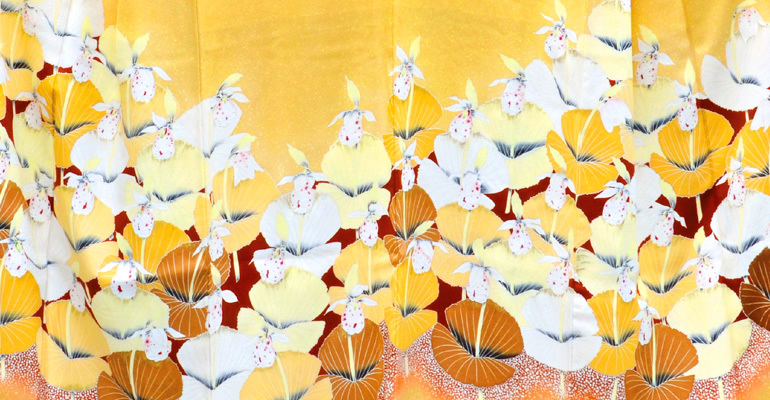 Traditional Japanese patterns are dyed into elegant, attractive items such as kimono (traditional Japanese garments), washcloths, handkerchiefs, shop curtains and scarves. 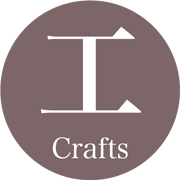 You can find some beautiful items to take home with you as souvenirs! 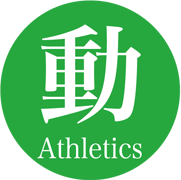 For many years, Kumagaya has been home to strong high school and college rugby teams, and the city has a world-class rugby stadium. 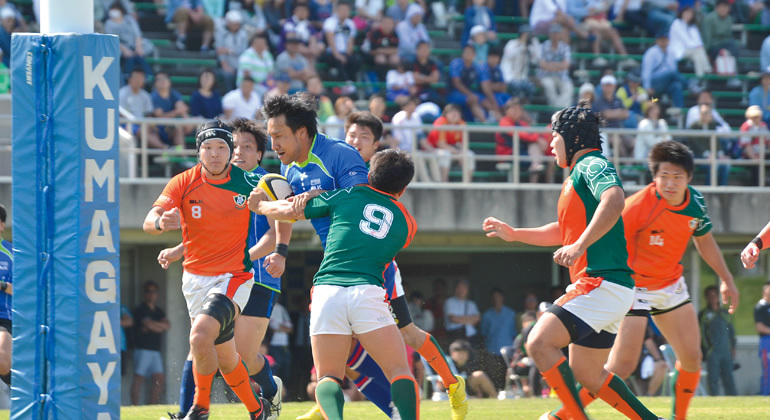 In recognition for the city's passion for rugby, Kumagaya Rugby Stadium has been chosen as one of the venues for Rugby World Cup 2019. 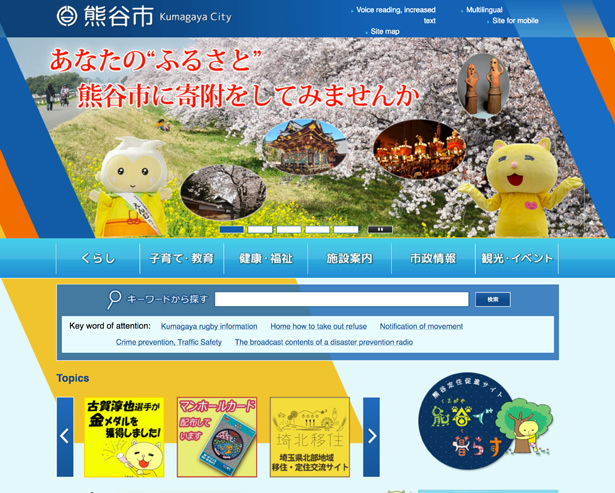 This is an opportunity for us to make Kumagaya a world-famous city. We hope everyone will support us so that we can achieve this!